Ravela Selandas is a Dunmer pilgrim who can be found in the Saint Olms Waistworks in Vivec City. 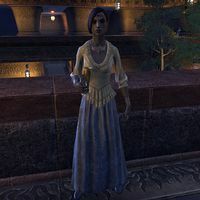 She stands with Methal Darithran and Weedum-Eius on the east side of the walkway above the central plaza and holds a goblet. Ravela has no unique dialogue. This page was last modified on 8 July 2018, at 07:48.